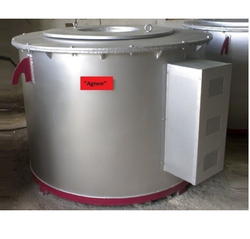 Supplier & Manufacturer of Pit Pot Furnace & Industrial Pit Pot Furnace. Our product range also comprises of Annealing Furnace, Fluid Bed Furnace and Chamber Furnace. With the comprehensive industry knowledge of the allied domain, we are engaged in presenting a superior quality range of Pit Type Vacuum Furnace. The furnace offers uniform temperatures in the range 1100–1500°C (2000–2800°F). Further, it delivers low contamination of the product by carbon, oxygen and other gases. In addition, the process can be computer controlled to ensure metallurgical repeatability along with quick cooling of products. Apart from this, clients can get the furnace from us at industry leading prices. We have gathered a huge customer base in this domain by presenting a comprehensive range of Pit Type Aluminium Melting Furnace. This furnace is commonly found getting used in industrial applications. The offered furnace has the single door for baking, heating and making molded products. It requires less space for installation and can be moved easily. 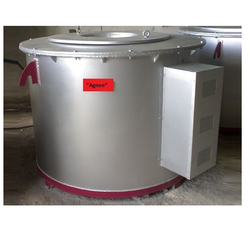 Also, the furnace is manufactured using stainless steel and coated with fire and heat resistance coated paint. Backed by our years of industry experience, we are betrothed in presenting an excellent quality of Pit Type Hydrogen Reduction Furnace. This furnace is used to change the viscosity (melt) of content inside the drum. The offered furnace delivers uniform heating which is absolutely necessary to prohibit wastage of content that remains solid inside the furnace. Also, the offered furnace is manufactured using quality grade steel sheet which is coated with heat and fire-resistant paint. Nitriding is a heat treating process that diffuses nitrogen into the surface of a metal to create a case-hardened surface. These processes are most commonly used on low-carbon, low-alloy steels. They are also used on medium and high-carbon steels, titanium, aluminum, and molybdenum. 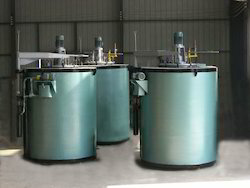 A vacuum furnace is a type of furnace that can heat materials, typically metals, to very high temperatures and carries out processes such as brazing, sintering and heat treatment with high consistency and low contamination. We are the prominent organization of this domain engaged in offering a wide spectrum of Pit Type Annealing Furnace. The stainless steel body coated with fire and heat resistance paint help in keeping the temperature at a moderate level. This furnace uses air as the medium for heat various industrial stuff and materials. The computer digital system that uses a micro sensor helps in controlling the flow of heat from tray to another.